STRATEGIC ALIGNMENT. 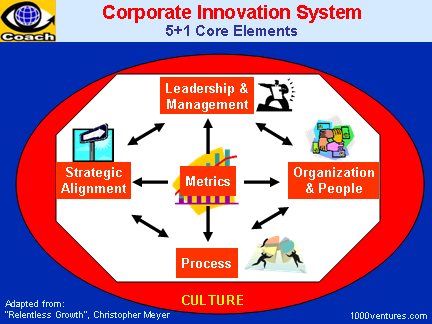 Innovation Management System Key Elements. Innovative Organization. Strategic Innovation. Strategic alignment is the process of linking innovation strategy with corporate vision, goals, objectives, and strategies. Strategic Innovation is the creation of growth strategies, new product categories, services or business models that change the game and generate significant new value for customers and the corporation. The Strategic Innovation framework weaves together seven dimensions to produce a range of outcomes that drive growth. The goal of the road-mapping is to develop the innovation strategy – to choose and do the right things. The goal of innovation management is to implement this strategy well. Road-mapping leads to effective project portfolio development and management. It provides for company-wide technological strategy development and technology assessment, as well as division-level project evaluation and strategic aligning. Road-mapping tools provide also a common language for innovation and building bridges between technologists and business managers within your corporation, and with you major suppliers and customers.